A recent report by Cisco’s Internet Business Solutions Group on young investors with $500,000 or more in investible assets “showed that more than a third of respondents had lost faith in the 'fairness of the market' and believe the individual investor doesn’t have a chance to succeed. Half expect to delay their retirement because of their losses” according to the Wall Street Journal’s Robert Frank. This is very telling to me. It shows that in the recent past, young investors have felt that wealth managers are more concerned with making money for themselves and not their client. 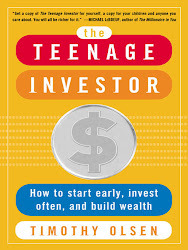 While on one hand it’s a bad thing that Gen Y feels as if they have no place to turn to besides the internet for investment advice, it’s also a great thing because one of the first steps to building wealth is understanding that most so-called “experts” in the wealth management business do not have your best interests at heart. After all, the goal of many people in wealth management is not to see that you grow your wealth, but rather, that you give it away to them! This is done through their advocating frequent trading for clients, constant sales pitches for new investment "ideas" and "cleaning out the inventory" of securities their company needs sold. Fred Schwed's classic book Where are the Customers' Yachts? explores the issue further with plenty of humor. Remember, you are your own best advocate! This does not mean that there aren’t good advisers out there. In fact, fee-only advisers with the Certified Financial Planner (CFP) designation are often outstanding sources of planning advice. Unfortunately, some brokers, “vice presidents” and other salesmen in disguise give the business a bad name and no doubt represent one of the biggest issues that Gen Y has with trusting experts on Wall Street. The image of Bud Fox in the moving Wall Street cold-calling investors can strike a raw nerve. Interestingly, it’s noted that in many instances, Gen Y trusts internet message boards and financial websites for advice over a human adviser. For one, the cost of consulting the internet for advice is minimal. On the downside, there may certainly be a lag time in having key questions answered and in other instances, the investor may not feel comfortable divulging too many personal financial details. With that said, there are some great online resources available for do it yourself investors. Besides Vanguard.com where you can actually set up an account to begin indexing, the Bogleheads, those investors following Vanguard founder John Bogle's advice, are an outstanding group with plenty of knowledge to go around. As always, it’s best to seek advice from those people you feel comfortable seeking advice from. If that person happens to be on the internet as opposed to sitting in front of you in an office, so be it! As part of my general investment philosophy, I tend to avoid investing in individual stocks because of my preference for low-cost, highly efficient and diversified index funds. After all, it's been proven that over the long-term, picking stocks is a loser's game and we often resort to market timing - shifting in and out of stocks to capture potential future price movements - which is a costly and ineffective strategy. Thus, if a company is borrowing money to meet a quarterly dividend payout, it's likely that financial distress is on the horizon (or is there already). So why do I recommend owning a basket of dividend stocks? In addition to your index fund investments, you can experience the true benefits of compounding if you own 5-10 large dividend payers and simply reinvest their dividends to buy more shares. Ultimately, not only will you receive more and more dividends because you'll have more shares, but if a company has been good about initiating dividend increases consistently, the benefits of compounding become even more apparent because you'll be receiving a higher payout from the company. Even better, this strategy is important for retirement because your income needs grow larger as you get older. What better way to have a large amount of quarterly income come in than to have all of those years of reinvested dividends now take the form of a quarterly check to you? I tend to stick with large companies who have a history of dividend increases in highly defensive industries. This strategy is much better than simply buying a couple of bonds because there are no maturity dates associated with individual stocks and it's less likely than inflation will eat away at returns because companies that have a history of raising dividends will likely do so at a rate higher than inflation. The title of this blog post may sound cheesy and conjure up images of the slick businessman with greased back hair, preying on the poor and unsuspecting in order to make a quick dollar. In fact, that's not what most millionaires are. Just as the majority of businesses in the United States are "small businesses", the majority of millionaires in the U.S. are average, everyday Americans who built the wealth themselves and/or with spouses. The majority don't inherit boatloads of money and it's usually hard work and ingenuity that pay off in the long run both professionally and monetarily. In fact, education is typically the main determinant of who will become wealthy. A recent study by Spectrem Group found out that, "Households with over $1 million are more likely to have a graduate degree than those in the $100,000 to $1 million segment. Thirty four percent of Millionaires have an advanced degree and 30% of the ultra-high net worth are similar. Fifteen percent of the UHNW are Doctors, 17% have a MBA and 6% are lawyers." All of this data leads me to the recent report that the U.S. millionaire population is nearing its 2007 peak of 9.2 million households. Currently, there are roughly 8.4 million millionaire households in the United States. So, how did this number grow 8% in 2010 and 16% in 2009? It's evident that our perception of millionaires as rich, jet-set types who are disconnected from the general public is way off base. Why? Because millionaires are the general public. They're your small business owners, accountants, doctors, lawyers, teachers and firemen...among countless other occupations. Ultimately, the question is - how did they get there? This leads me to my main point - how to become a millionaire. This may sound too simple but the answer is that simple. First, when you keep costs low, you'll get to keep more of the net income that you bring in via your paycheck and by not sacrificing personal well being (something many cost cutters do), you'll be happier and much more likely to have the drive to work hard and go out and do a good job day after day. Even better, you'll enjoy life! There's no reason to be a miser or a cheapskate because we only live once and we can't take it with us as they say. Secondly, max out your Roth IRA contributions. Roth IRAs are retirement accounts that allow your current after-tax earnings to compound tax free. Right now, Gen Y can contribute $5,000 to their Roth IRA accounts. This is great for investors because you will not have to pay taxes on any of the earnings when you start withdrawing from the account. Also, take advantage of your employer's 401(k) plan and be sure to max out your contributions to the plan (if feasible) so you receive the biggest employer match - you're basically receiving free money by doing this. Lastly, systematic investment in index funds is the surest way to build long-term wealth. Consider this: At age 30 you are armed with an MBA and a job that pays $80,000 (roughly the average MBA's salary). You have $35,000 saved already and invest $9,600 a year ($800 a month) for 30 years at a 7% return. Even if you didn't add anything additionally along the way, you would end up with $640,394.62. Talk about the power of compounding! Through education, hard work and systematic investment, becoming a millionaire is easier than it seems. As long as you stay dedicated and disciplined throughout the process, you will have a great shot at joining the 8.4 million other households who consider themselves millionaires in the United States. I'm going in a different direction with my post today because I want to highlight a fact of life that all investors will have to deal with at one time or another: hindsight is 20/20. I have a couple of individual stocks - "legacy holdings" - that I've held since I was younger and before I knew about the virtues of index funds. I'm gradually selling them off to move all of my holdings into index funds and one of my holdings is up roughly 30% since I sold it. For a New York minute, I was kicking myself for leaving money on the table but this is precisely why individual stock picking is generally a bad idea: we get greedy and this results in market timing. Sure, the stock is up 30% but it could just as easily have been down that amount. This brings me to an important point: when you sell a stock, fund, or otherwise make any investment decision, let that be the end of it. It's easy to play games of what if but that won't change the fact that you made the decision you did. Be at peace with your decisions. There's a mysterious character in the world of investment management and he's known as the closet indexer. The mystery surrounding this character is made maddening by the fact that while his actively managed mutual fund may indeed be highly correlated to a benchmark like the S&P 500, he's likely to trail the return of the index after fees and expenses. Unfortunately, many actively managed funds are now "closet indexing". You may wonder why I am so against this practice when I'm such a strong advocate of index funds but the answer is simple: not only do you get hit with larger fees and expenses for investing in the actively managed fund, you're likely to experience under-performance in certain markets because the funds are still actively managed and may be more conservative or aggressive to capture some upside in falling or rising markets. This is a recipe for disaster because it's not likely that the manager will be perfect all of the time, further hampering returns. Martijn Cremers, a finance professor at the Yale School of Management points out that the main rationale for this practice is that individual investors are more "benchmark aware" and they are quick to sell funds who underperform a given benchmark. After reading this, it sounds like they just don't know about the virtues of actual index funds! The Smart Money article linked above highlights the main issue: "of the 514 actively managed funds in Morningstar's large-cap blend category, 79 mimic the index almost exactly . And that means they're almost guaranteed to underperform, because 'you'll get the market return – less the fees,' Shannon Zimmerman, the associate director of fund analysis at Morningstar." I was more shocked by this quote from the manager of an actively managed fund that the article dubbed a "closet indexer": "Scott Glasser, co-manager of the Legg Mason Clearbridge Appreciation Fund, says that while his fund has been highly correlated to the S&P -- and charges an expense ratio of 1.05% -- it is more conservative than the index and has outperformed its benchmark over the past three-, five- and ten-year periods. 'This fund may have higher fees, but it's earned those fees over time,"
I'm really not too sure how the fund "earned" its higher fees over the long-term and it begs the question - why settle for mediocre performance that's made worse by excess expenses when you can just buy an index fund and be done with it? The article mentions that the Vanguard 500 Index Fund (VFINX) has a 0.18% expense ratio while the SPDR S&P 500 Index ETF (SPY) has a paltry 0.09% expense ratio. To me, the choice is clear: stick with the real index fund and avoid closet indexers.